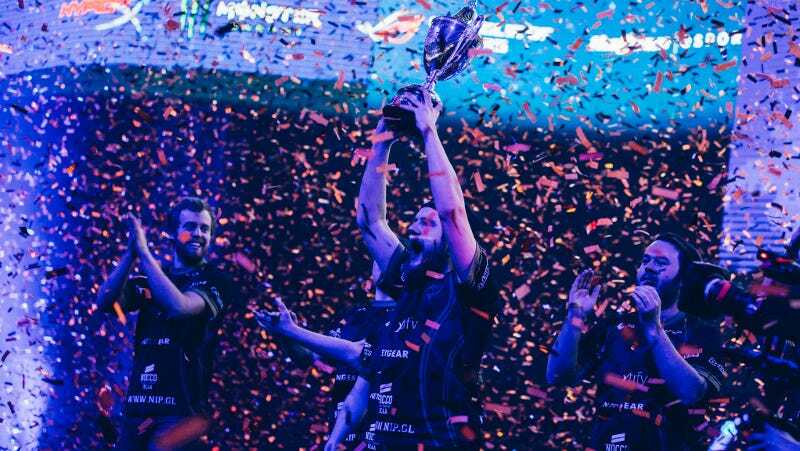 After keeping fans waiting ages for a comeback, Sweden’s Ninjas in Pyjamas team upset expectations on Sunday to win the DreamHack Masters Malmö Counter-Strike tournament, in front of a fanatically loyal home audience. NiP was the team to beat in the early days of Global Offensive, enjoying the longest winning streak in pro Counter-Strike history, but the team fell on hard times as the scene developed around them. There were signs of life a couple weeks ago at MLG Columbus, where the team looked strong even with their new coach, THREAT, playing as a substitute. Now they’ve finally battled back to a first-place finish. A lot of that is down to Christopher “GeT_RiGhT” Alesund, who had a tremendous weekend and a remarkable final day at DreamHack Malmö. He was a consistent difference-maker in close rounds, making saves as the last Ninja standing in “clutch” rounds and presenting a consistent ambush threat throughout the day. While he didn’t post mind-boggling overall stats, he did something more important by tipping close matches to NiP. There were a lot of those on Sunday for NiP, including a final against MLG Columbus runner-up Na’Vi that was decided by a total of four rounds. Na’Vi’s status as the official second-place finisher of Counter-Strike: Global Offensive is starting to look like it’s etched in stone, regardless of whether Fnatic are around. Na’Vi always looked like a team that just had the bad luck to be competing at the same time as a freakishly strong series of Fnatic lineups, but their finals disappointments are worryingly consistent. NiP weren’t the only people to be resurrected at Malmö. One of the tournament’s other major surprises was Markus “pronax” Wallsten’s new team, GODSENT (which could have seemed like a pretty silly name if they didn’t place well). Pronax was the heart of the old Fnatic team, but he was shown the door late last year and his replacement inaugurated a new era of dominance for Fnatic. Pronax isn’t going quietly into that good night of esports (also known as a player’s mid twenties). GODSENT came back to beat mousesports in the quarterfinals and came excruciatingly close to topping NiP as well. Having the former Fnatic leader return with yet another top-shelf Swedish team was a gift to the DreamHack crowd, who seemed to be trying to will GODSENT past mousesports on Saturday. However, I can’t help but wonder if one of the reason that DreamHack Malmö witnessed so many surprisingly strong results for underdog teams is because attrition is starting to tell on the leaders. Fnatic pulled out of the tournament because of injury problems, and Na’Vi didn’t seem confident that their star sniper, GuardiaN, could work his AWP rifle for an entire series. On top of that, neither Luminosity, Astralis, nor Liquid made it out of groups. Any one of those teams losing in groups is not a huge deal, but all of them going out early has me wondering if competing in so many international tournaments in so short a time is going to wear-down CS:GO’s top teams and players. It could just be that the field is starting to compress as more teams get more opportunities to compete at a high level. One of the major shocks of this tournament was the arrival of China’s TyLoo squad in the playoffs, as they knocked both Liquid and Luminosity out of the tournament. While Global Offensive’s past might be overwhelmingly centered on Eastern Europe, the game’s future is looking more international by the week. But for the present, at least, Ninjas in Pyjamas have once again re-established themselves as a strong Counter-Strike team worthy of a Swedish fanbase that has come to expect nothing less than greatness.